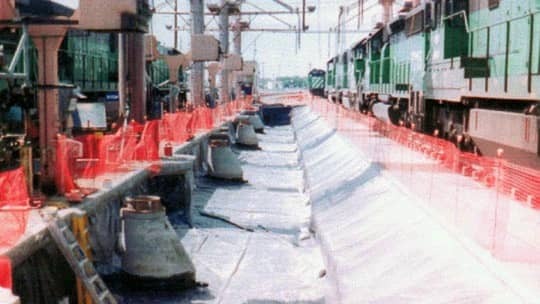 The existing Burlington Northern Santa Fe (BNSF) Alliance, Nebraska railyard chose XR-5 to line the entire fuel car unloading area a provide secondary containment around two above-ground diesel tanks. The existing Burlington Northern Santa Fe (BNSF) Alliance, Nebraska railyard was in need of a new fuel car unloading facility. Loaded with diesel fuel, these fuel cars come in to a pumping station and the fuel is then sent to existing storage tanks. B.N.S.F. has used XR-5 in the past at several railyard locations and has been pleased with its long-term resistance to diesel fuel. For the Alliance site, XR-5 lined the entire fuel car unloading area and provided secondary containment around two above-ground diesel tanks.